General Roberts, former Chief of Army Reserves, and Executive Director of the Reserve Officers Association, has held numerous leadership positions in military offices through federal appointments, and cultural and civic offices through elections held in patriotic and, or, lineal societies. He has served as President and Director of High Frontier, an Advocacy group that promotes legislation for missile defense. General Roberts answers the call to speak before groups of all ages about his experiences and the importance of serving one's country. His biography appears in Who's Who in America. Roberts is a veteran of World War II and served as a glider infantry officer until he was appointed as Aide de Camp to Major General Leonard Gerow, Commander of the V Corps of First U.S. Army. He landed on Omaha Beach, June 6, 1944 during the Invasion of Normandy. He participated in the next five campaigns, including the Battle of the Bulge. After the close of World War II, Roberts held dual positions in the roles of Public Relations and continued his military service in the Reserve. In January 1946 Roberts joined the Sykes Advertising Agency in Pittsburgh, Pennsylvania, and became President of the agency in 1948. In 1970 General Roberts was appointed by the President and confirmed by the Senate to serve as Deputy Chief of the Army Reserve at which time he moved to Washington, D.C. to assume his new position. Roberts was promoted to Brigadier General May 1968 and was the Commanding General of the 99th Army Reserve Command in Pittsburgh. In l971, promoted to the rank of Major General, once again he was appointed by the President and confirmed by the United States Senate to serve in the Pentagon as Chief of the U.S. Army Reserve, a position he held until 1975. In 1975 Roberts became the Executive Director of the Reserve Officers Association and served in that position until 1984. During his diverse and extensive career, his interests have included leadership positions with the Jaycees at which time he was selected as One of 100 Outstanding Young Leaders of Pittsburgh and appeared on the cover of Time Magazine. He was an officer in the Young Republicans, raised funds for the Pittsburgh Symphony and Co-Founded an Episcopal Church in Pittsburgh where he served in the vestry for several years. Roberts was Co-Founder and President of the National Historic Intelligence Museum, and was President of the Free Afghanistan Committee, Director of Coalition of Sound Money, and Director of the American Security Council. He has served as President of the American Coalition for Competitive Trade and other organizations advocating a strong defense for America. He was Director and Congressional Liaison for the Space Transportation Association. He has served as a Director and Advisor of the World War II Veterans Committee for six years, and has been the principal speaker during veteran's conferences regarding World War II Invasion of Normandy, Omaha Beach, June 6, 1944. He has led discussions and conducted seminars before hundreds of school children, college students and conferees, especially at May and November conferences. General Roberts has served as Moderator for several C-PAC conferences. He is Chairman of the Dwight D. Eisenhower Society, Gettysburg, Pennsylvania, a group whose mission is to preserve the legacy of General Eisenhower and one which distributes grants to worthy causes. He has served as President of the Capitol Hill Executive Service Club, the beneficiaries of which are First Responders of the Capitol Hill Police and Capitol Hill Firefighters. 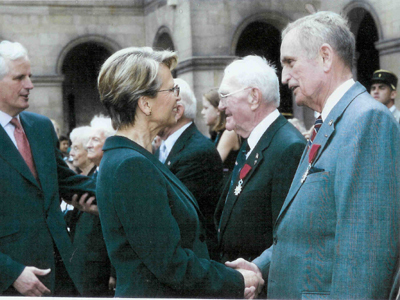 In 2004 he led two tours to the Omaha Beach, Normandy, France, to demonstrate his first hand experiences and to speak directly and in person to the assembly of 55 Americans who joined the tour to hear and to learn about that day June 6, 1944, and other historic battles he participated in, including the next five battles ending in Pilsen, Czechoslovakia. General Roberts spoke before hundreds of listeners during these conferences and tours, in Paris, and in Portsmouth, England, where he was interviewed for international radio and television. Indeed, General Roberts has been a much sought after and popular speaker not only in the United States but in other countries a well. He has appeared countless times on television, including the Ted Kopple Show, giving advice on subjects of national security, military interests as well as a strong missile defense. For six years, General Roberts has been the Co- Host with his wife, Priscilla, on their radio programs, 'Generally Speaking' through Liberty Radio and 'Front and Center' and 'The Greatest Generation' on Radio America. These broadcasts were heard across America and Armed Forces Radio. As such they interviewed dozens of guests; authors, politicians, scientists, and most of all, World War II Veterans. The Roberts made sure each guest received a recorded copy of the program, and because of this courtesy, they have received many notes of appreciation from the grateful family members, many of whom never knew the veterans history, and they were especially appreciative to have the recording of their veteran's voice as he or she spoke of their war time experiences. Roberts and his wife were Committee and Co-organizers of Military Appreciation Week in the District of Columbia, sponsored by the Mayor of Washington. The event was held on Freedom Plaza in 2002 and great emphasis was given to recruitment of young people into service in the Armed Forces. In attendance was the District's Representative, Miss America. The Roberts made arrangements for displays of equipment, jeeps, tanks and trucks for visitors to learn more about working with the mechanics of World War II. This prepared the Roberts for their next patriotic endeavor; the Co-Founding of the First Memorial Day Parade by Veterans to be held annually in the District of Columbia which was successfully accomplished in 2004 and continues today. 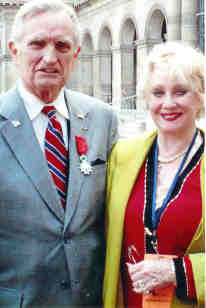 Throughout his extensive military career, he has received many awards and honors including the Distinguished Service Medal, Legion of Merit, Bronze Star Medal with cluster, French Croix de Guerre with Silver Star, Czechoslovakian Military Cross of 1939, and the Bronze Arrowhead for the D-Day Normandy Invasion on Omaha Beach, (June 6, 1944). In 1984 he was awarded the Navy Distinguished Public Service Medal, The Air Force Exceptional Service Medal and the Coast Guard Distinguished Public Service Medal. 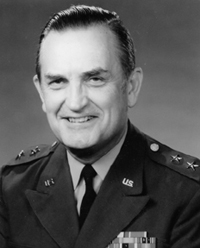 General Roberts was inducted into the Minuteman Hall of Fame, Reserve Officers Association in 1975. He has been recognized as a distinguished military leader by the Society of Cincinnati and received a Distinguished Military Service award from the Sons of the American Revolution as well as the Gold Good Citizenship Medal. He has numerous certificates of appreciation from SAR and DAR. Citation: General Roberts has been awarded the honor by appointment of the Grand Prior of the United States, and is admitted as a Member of the National Order of Merit of the Military Knighthood Order of the Knights Templar in the rank of Grand Commander. He has received another honor from the Knights Templar, with the designation of 'DIGNITY OF CHEVALIER (KTJ)'. He is a graduate of the ROTC program at Lehigh University in Bethlehem, PA and the U.S. Army Command and General Staff College. He holds certificates from the U.S. Army War College and the National Defense University. Roberts has appeared on the cover of several national publications and recognized in Time Magazine. The highest honor accorded a member of Sigma Chi Fraternity is the "Significant Sig Medal" which was awarded to him in 1973. General Roberts has been the featured speaker on national defense issues before hundreds of audiences in the United States and abroad, and has appeared on television and radio programs, including ABC�s Nightline. He and his wife, Priscilla, (P.B. Bruce) host a weekly radio program titled "The Greatest Generation". It is broadcast over Radio America and heard around the country and internationally over Armed Forces Radio. General Roberts is a descendant of Colonel George Gibson, one of General George Washington�s Commanders at Valley Forge. He is a member of the Society of Cincinnati, the Sons of the American Revolution, and several Masonic organizations including Sojourners. He has served as an officer and is a member of numerous Veterans Service Organizations including, The American Legion, the Veterans of Foreign Wars, Military of World Wars, and the Disabled American Veterans. In 2004 he became a member of the American Society of the French Legion of Honor, and has served as President of the Capitol Hill Exchange Club. He and his wife belong to numerous patriotic and lineal societies and such social organizations as the Washington Assembly, Black Tie, and the Sulgrave Dinner Dances. They hold memberships in numerous charitable and diplomatic related organizations such as The Meridian House, T.H.I.S., and Achievement Rewards for College Scientists. General Roberts is the father of two sons and two daughters by his first wife who is deceased, and he has eight grandchildren. In 1995 he married the former Priscilla Bruce Thompson and together they reside in Arlington, Virginia. Copyright © 2006, Generally Speaking®. All rights reserved. Click here to view patent certificate.